One of Telerivet’s most popular features is the ability to easily conduct polls and surveys via SMS or missed calls, anywhere in the world. For example, Farm Radio International, in partnership with dozens of radio broadcasters, has already used Telerivet to gather over 150,000 votes from radio listeners across Africa. With thanks to feedback and input from our great community of users, we’re happy to announce two new tools that make Telerivet’s polling feature even easier and more powerful. Telerivet makes it easy for you to create and run mobile polls. Now, we also make it easy for you to explore the results of your polls. 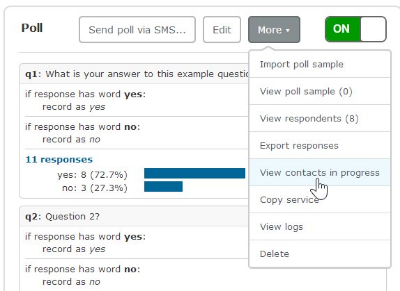 While you’ve always been able to see a basic overview of your poll responses on Telerivet, if you wanted to get more insights from your data, you needed to export your data (to CSV). Telerivet makes it easy to combine multiple filters so you can spot trends in your data. The response was received on or after March 5. And of course, you can still export your data to CSV (under the “More” menu). If you’ve ever sent out an SMS poll, you may have found that not everyone responds. For some people, it might take a little extra nudge in order for them to reply. Now, Telerivet makes it easy to remind people who haven’t responded to your poll yet. The “Contacts in Progress” page shows contacts who you’ve sent the poll to who haven’t responded yet. If your poll has multiple questions, it also shows contacts who have started your poll but not yet finished it. The “Current State” column shows the ID of the question that the contact is currently answering. 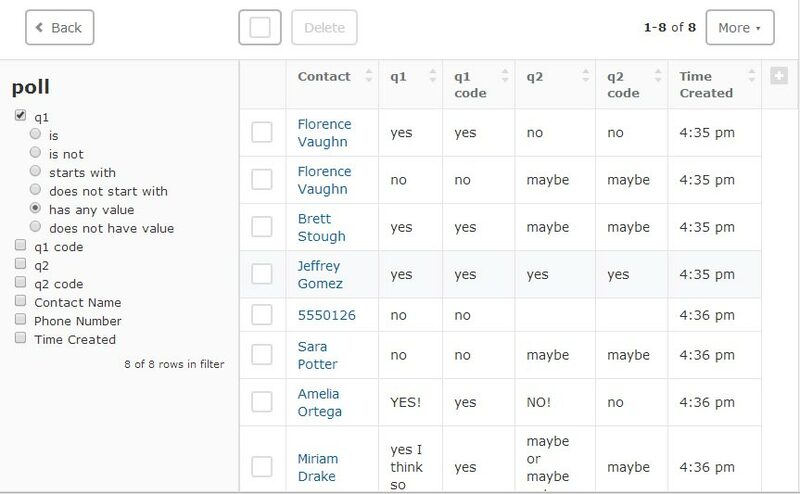 Like with the response data tables, you can easily sort and filter these contacts to find just the ones you want. To remind people to complete your survey, you can select one or more contacts and click “Resend Question”. 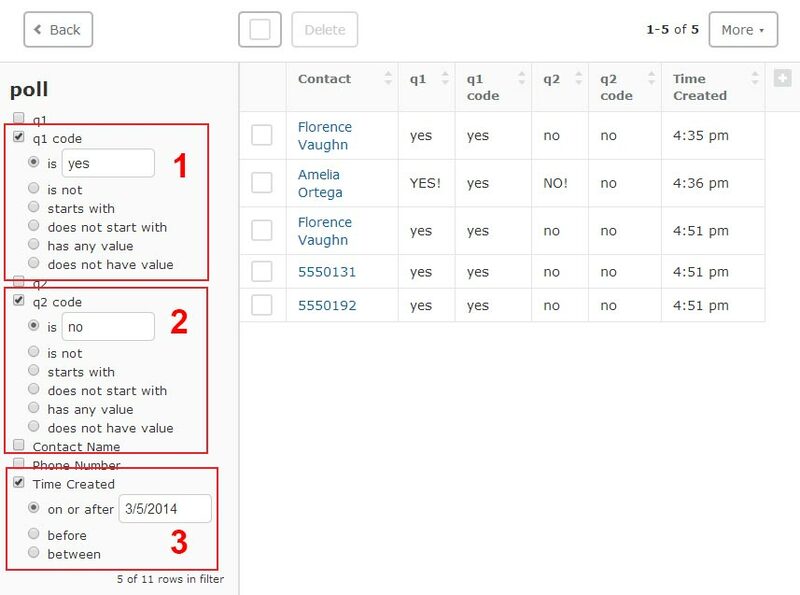 If your survey has multiple questions, this will send the current question for each contact, so your contacts pick up right where they left off. Or, you can click “Send SMS” to write a custom message. You can message everyone who hasn't completed your poll yet — possibly hundreds or thousands of contacts – or just certain contacts matching a particular filter. For more advanced users, the “Set State” and “Reset” actions also let you manually change the question that a contact is currently working on. Under the “More” menu, you can also export the data from this page to CSV. To try out the new poll features, head over the Automated Services page on your Telerivet dashboard. If you don’t already have a poll, try it out by adding a "Poll / Survey". Let us know what you think! Telerivet has an amazing community of users, and we find ourselves ever impressed by the creative and inspiring ways you use the platform. If you have any more suggestions for new features and improvements, drop us a line at info@telerivet.com. Stay tuned for even more big updates coming in the next few weeks.